Breakfast and thereafter with picnic lunch, cycle 30 km to Malangi Village where you visit the Barbaig Tribe for Barbaig Cultural Insights/Contrasts. 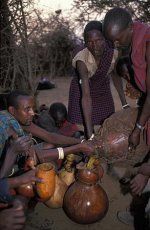 The Barbaig is an authentic tribe; still conservative on their culture; cattle rearing , warrior like the famous Maasai with the women still wearing traditional locally tanned goatskin gowns. rowing while viewing floating hippos. Walk back for dinner and overnight. Price: US$ 90/80.00 per person each of 1/3 persons respectively. . Inclusive accommodation, meals, guide, levies; excludes transport, bicycle hire US$ 5; US$ 5.00 local canoe hire per 2 persons, drinks and tips.